What did you make the window vents from? Was it a fizzy drinks can carefully cut out and if not, what sis you use? I think if I was to make the rear vents in the tailgate below the rear window, I would use some modelling clay. What have you used? I'm liking this very much!!!! That's great, thank you very much. Must have taken a while to get right, but the result is superb! I know David (Cowley) and I are making prototype models currently, so this will be VERY helpful indeed. How about the tailgate vents? What did you use for those, may I ask? The 'tailgate' is the name given to the rear door that opens upwards to access the luggage area. It is also called the 'boot lid', and the luggage area is called the 'boot' or 'trunk' if you are American! In your earlier photographs, the small air vents on the boot lid were missing. After David mentioned them in his earlier post, you have put the vents on the model as shown on David's photograph, above. I was wondering how you did that? Thanks Olivier, I understand what you have done. It looks terrific too! We're all learning something today!! Thanks for your explanations, Olivier, they are very helpful indeed. Not being a 6r4 Man myself (COUGH) I can still appreciate the workmanship that has gone into this creation! Being a 6R4 man myself... cough cough! lol ...this is quality work Olivier, well done! One question : Where did you get the wheels & tyres from? 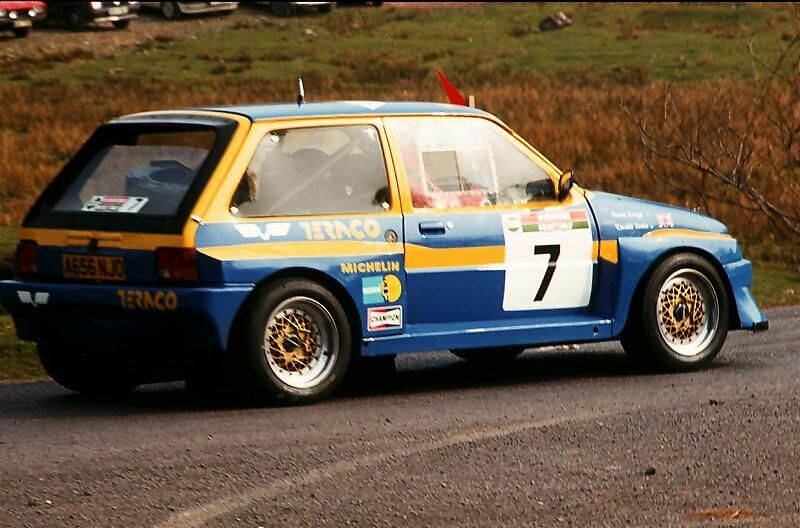 The wheels and tyres look like Scala 43 to me, but I'm more than happy to be wrong!! Simply means a potential new supplier I haven't previously known about! Cowley wrote: Others might also not reailse it, but the four photos posted by Mark are NOT the real car! The car featured was based on a standard front wheel drive Metro road-going saloon that was fitted with the correct bodywork, livery, interior, and roughly the right wheels - purely for 1984/85 promotional duties for Yorkshire TV's 'The Winning Streak' drama that the real car was being filmed for at the time.